New York City's Tigers & Monkeys will perform at Charlotte's Snug Harbor on October 26th. 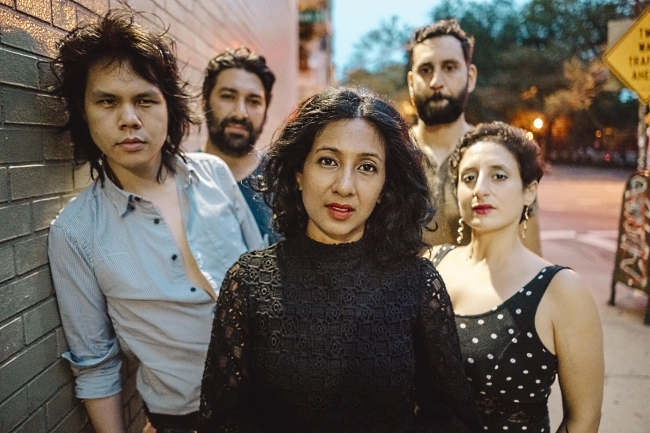 To get you hyped for the show, singer and guitarist Shonali Bhowmik sat down with us and talked about Diamond Dave, performing at strip clubs, her dream music festival, and more. Our formula of rock n' roll runs the gamut from garage rock, indie pop, bluesy southern rock, mixed with some folk. We have lots of influences like old school stuff such as the Stones, to '90s indie rock like Pavement, to current indie rockers like Courtney Barnett and Twin Peaks. I went to a Van Halen concert when I was in the 6th grade when David Lee Roth was the front man. My life changed forever. I was initially scared to go to the show convinced I was going to a Satan worshipers' show but the music was something I knew I had to witness live. 'Til this day I have yet to see a band that was more transcendent than Van Halen (there was a Talking Heads concert I will never forget.) I don't believe any rockstar could get away with cheesy assless chaps like Dave did! What about the gongs on fire and samurai sword performances - it was amazing! Oh I could go on and on... but it was after that show that I literally went to every concert of every music genre I could go to while growing up in Nashville, TN. Oh I will never forget this one - UBF played at Sluggo's in Pensacola, FL and there was a guy rocking out in front of the stage. He yelled up at us while we were playing and said "Do you want me to break this bottle over my head?" We responded "Nooooo!" and he proceeded to take a beer bottle and crack it over his head. With blood flowing down on his face he proudly proceeded to rock in front of the stage for the rest of the show. It was pretty traumatic for us. Food!!! Food!! Food!! Where should we eat in Charlotte? Next is good coffee? Where do we go? Since I have personally toured so much before I started Tigers & Monkeys, I was ready to be in a band with a different sort of mindset, which is one that does occasional short tours, and that I highly recommend. In terms of time spent in the van, I usually read, catch up on sleep or do work on the computer. It's nice to not have to rush to the next town and if so, depending on what town we are going to next, like most rock n' roll bands on tour, its fun to stop good thrift stores, coffees shops, record stores or music stores. Historical monuments are also good! I remember once being able to stop at Mt. Rushmore and also Yellowstone National Park on tour which was so dreamy. I've never thought about it but I guess I traditionally go over the set list in my head a few hours before the show. I scramble around to get ready for the show. I have a beer with my bandmates and then get on stage. But I don't burn sage or do any real vocal exercises before our shows. Perhaps I should. I would say to make sure you are prepared to roll with whatever happens on the road. There are so many things that can go wrong and at the end of it all, the bottom line is you should be having a good time. I've been in the middle of a show in Georgia which ended up being cancelled due to a power outage; there was the hurricane in Florida; and then there was that show in New Orleans where after after an amazing show where we packed the venue, we received news that the booking agent was fired and the club owner wasn't going to pay us a dime. I stormed into the back office which was a scene out of Goodfellas to demand we get paid and I came out with $20 to split between two bands. Somehow, it still makes me laugh today. This is a great question! I love live seeing live music and my favorite way to see a performance is in an intimate venue but I have also played a number of music festivals and it was amazing to be able to be on the side of the stage watching so many brilliant performances. The idea of curating my own lineup would be heavenly so thank you for allowing me to do this! I would start with 1) Jimi Hendrix is one of the most electrifying performers I have never witnessed live. 2) Prince, the most electrifying performer I have witnessed live. 3) Broncho, a contemporary rocking, fun, "don't take themselves too seriously" indie rock band from Oklahoma. 4) Kate Bush, there is no one else like her in the world. I would especially love it if she included the theatrical dancers she used to dance with in the '70s. 5) The Savages floor me! I have now seen them live 3 times and each time its been an experience in which I feel like I am the only one in the venue because noone else in the room matters. As for the final jam, I think it would be Led Zeppelin's "Immigrant Song." Thanks for making me live this festival in my mind. It's amazing!